Welcome to McCall'sBar-B-Que & Seafood! We have been serving the community since 1989, specializing in pit cooked BBQ Pork and Calabash style seafood and much much more. 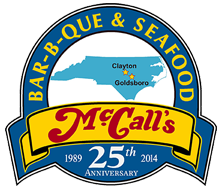 McCall's Barbecue and Seafood Restaurant is open to serve you our fresh home-style specialties, from old fashioned barbecue cooked on an open pit, to a great variety of country vegetables and homemade desserts! You can always look to the friendly folks here at McCall's BBQ & Seafood to address all your special occasions. We offer on-site caterings for any size event, as well as delivery for any size function you may have. Since 1989, our family owned restaurant has been a neighborhood landmark as a favorite place for locals, as well as out-of-town guests. We offer a full buffet, as well as lunch specials from 11am until 2pm every day!